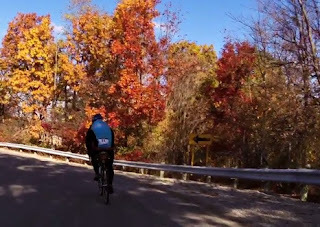 The last organized ride in Ohio usually occurs on the first Sunday in November. This year it was moved up one week or it would have fallen on the morning after a red-letter day, Halloween. Velo Junkie and I had been wanting to do this ride for several years but something else always seemed to happen the same weekend. Since we were going to participate this year we had to dress the part. I didn’t have a red flannel shirt but I did have a vermillion wool jersey. Perfect. Velo had a plaid jersey that was maroon so it had the appearance of being flannel. The Lorain Wheelmen put on quite an event, and I have to hand it to them, attendance can be scarce depending on what Mother Nature decides. This year was perfect. As the saying goes, “red sky at night, sailor’s delight”, this time it was a cyclist’s delight. The scarlet sunset on Saturday night was inviting as Velo and I drove to northern Ohio. After breakfast of oatmeal and cranberry juice we drove to the Oberlin Community Center. If it wasn’t for all the spandex tights I would have thought I was at a lumberjack convention. There was at least fifty shades of red flannel shirts and one group in their rose colored Dr. Dentons. The start of the ride took us past Oberlin College, an old campus full of brick buildings the color of oxblood and stone structures in greys and tans. It wasn’t long before we started to see the autumn trees. There were so many vibrant colors it was almost an assault on the senses. Sixty-four miles of crimson maples and auburn oaks; flame colored sugar maples and wine colored sweetgum trees; and the occasional amaranth colored Japanese maple. The red barns that dotted the surroundings were camouflaged among the copper, auburn, and cayenne leaves. We even visited with a big red bull. Landscapes were adorned with mahogany tinted mums, coquelicot sumacs, garnet burning bushes, and ruby hydrangeas. Thickets of sassafras in hues of burnt sienna and mulberry lined the creeks. 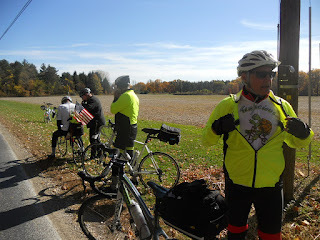 There were only two rest stops on this ride but once you visited one you knew why. Homemade chilies and baked goods along with PB&J sandwiches, trail mix, and fruit made it easy to go the distance. Even when we made a wrong turn, went up a 14% grade we weren’t supposed to, and added four extra miles to our ride. Velo had chili at the first stop in Mill Hollow, and black bean soup at the second stop in Milan, birthplace of Thomas Edison. I opted for peanut butter at the first stop (remember the buffalo trots) and then had the vegetarian recipe at the second stop. When we finished back at the Community center there were some home baked ginger snaps, my favorite. I think I fell short of naming 50 different shades of red. If you watch the video and check out the pictures you’ll get the idea.